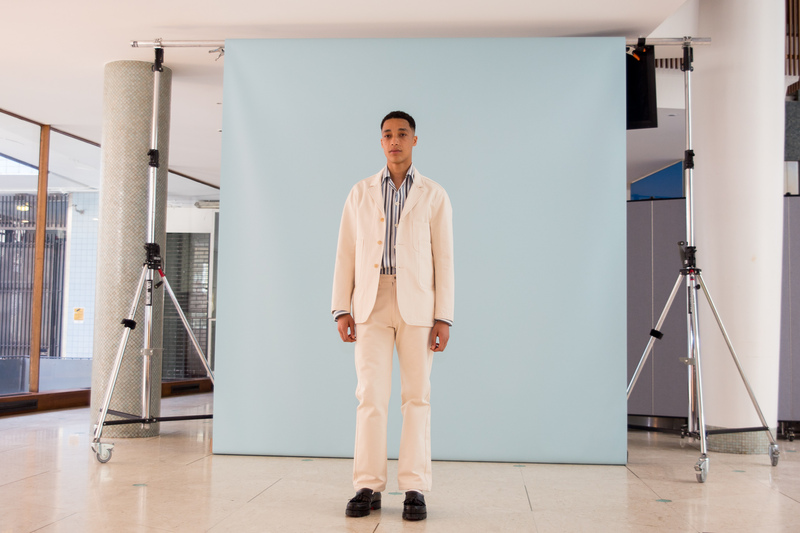 Models lined up against the backdrop of the Trade union statue as Patrick Grant invited guests to observe the shooting of his Spring/ Summer 19 lookbook. 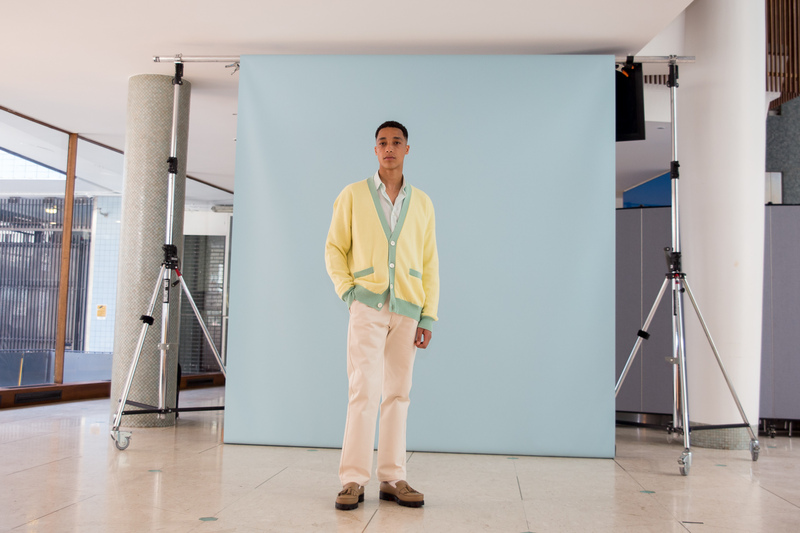 In signature E.Tautz fashion, classic oversized tailoring with military and 80s influences throughout presented the contemporary British Gent. 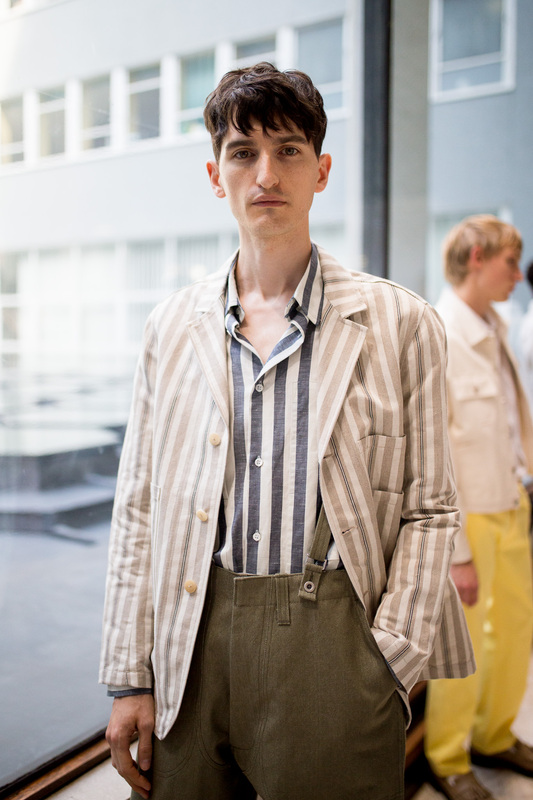 Refreshing pastels and muted stripes painted the loose, flowing shirts and schoolboy shorts. 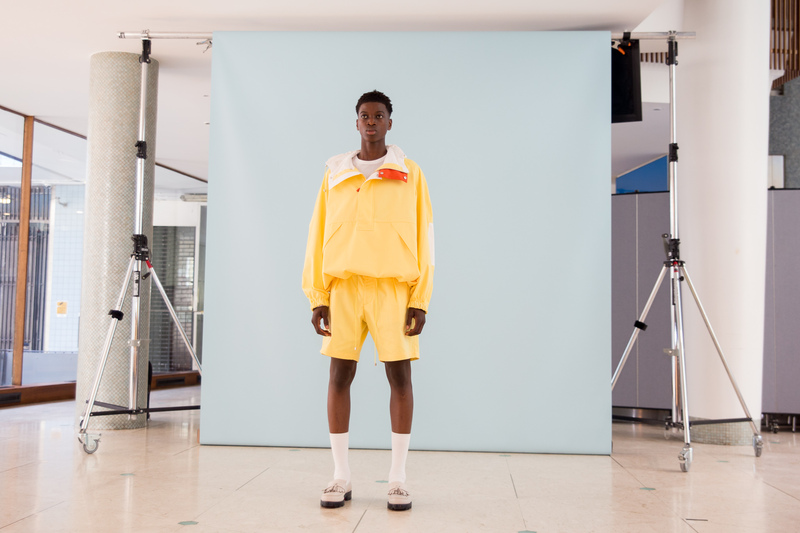 The Vibrant sweatshirts and billowing windbreakers paired with pulled up sports socks and loafers elevated the tailored elements – exuding a youthful nonchalance. 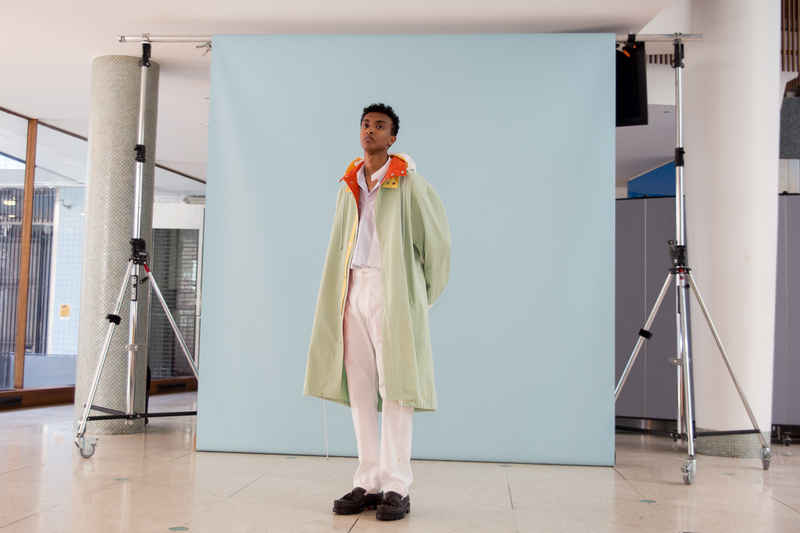 Appropriately staged in the trade union Congress Centre, Grant talked through his spring summer ’19 collections – emphasis on encouraging reflection on Britain’s garment production industry and the provenance of our clothes. Manufactured primarily in Lancashire, Elongated pockets and and thick reinforcements on ecru denim dungarees reflected Mill workers uniforms and anchored the draping shirts to the body; providing the silhouettes with structure. The printed slogans adorning the sweatshirts, although appearing rudimentary, nod to Miner Strikers placards attacking sweatshop labour in the 1840s. A historical reference that remains ever relevant in today’s textile manufacture industry. Grant shared an anecdote on one particular motif featuring a Skull with the numbers ‘2 1/2’: a subtle reference to the 2 and a half pence paid to shirt maker driven to stealing a shirt to feed her children. A wage not too dissimilar to many workers in Factories in Asia today. 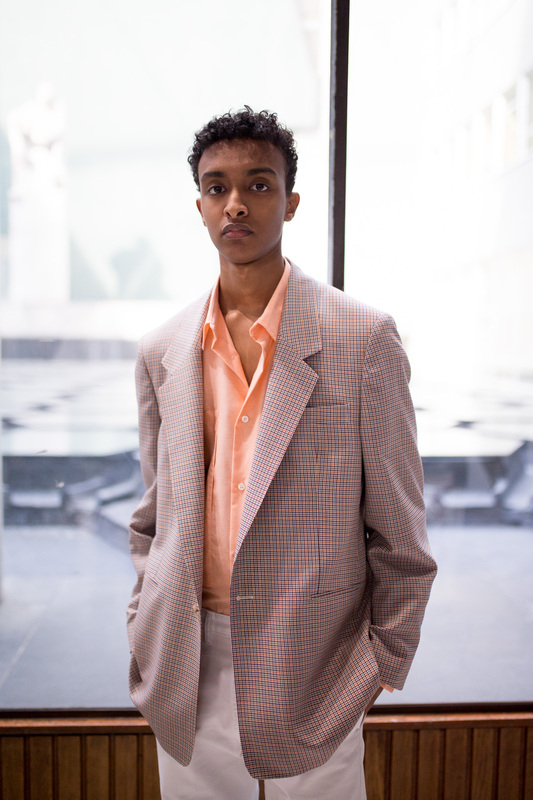 Despite evoking a more crude air of adolescence than previous seasons, the collection was grounded in a message becoming more prevalent for E.Tautz. 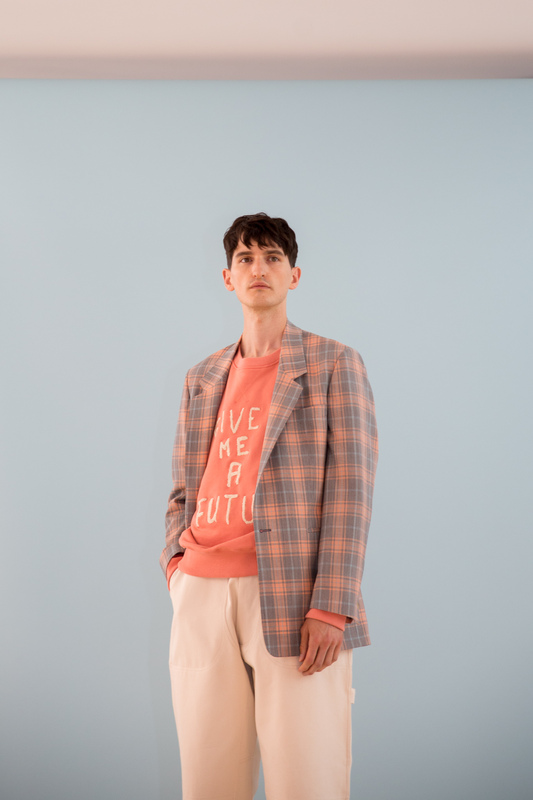 It was a proud celebration of the textile heritage of Britain, and provided a precedent for how the E.Tautz brand hopes to continue creating a future for our garment making industries.